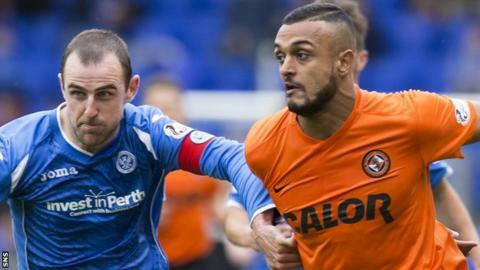 Striker Mario Bilate has expressed his "sadness" after he and the Scottish Premiership club agreed terms for his exit from Tannadice. The Russian-born 24-year-old picked up a season-ending injury in September. "I wish I could have shown more to the supporters who have always been very supportive of me," said Bilate. "However, I know at this stage it is the right thing to do for the club and myself and I will now look to progress my career elsewhere." Bilate is the first departure from Tannadice since Mixu Paatelainen took over from sacked manager Jackie McNamara last month with the club sitting second bottom of the league table. "I am sad to be leaving as I feel that, despite the current position in the league, the players and the team are improving things," said the striker. Bilate, who was brought up in the Netherlands, joined United in July 2014 after being released a year early from his contract with Dutch club Sparta Rotterdam. A series of injuries have meant he only started eight games for the Scottish club, with another 10 appearances coming from the substitutes' bench. Bilate scored two goals for the Tannadice side in that time. United said on a website statement: "We know how disappointed he is not to have featured more regularly, but this announcement allows him to look to the future."